Vinyl backdrop curtains provide visual and sound barriers around tennis courts, multi-purpose gyms, and running tracks. Vinyl tarps can be used as as covers as well as impact panels in batting cages. ALL CARRON VINYL CURTAINS AND TARPS ARE MADE TO ORDER. Click on any choice for more information and to request a quote. Frequently used for: tennis courts and running tracks, light and medium weight divider curtains and nets. 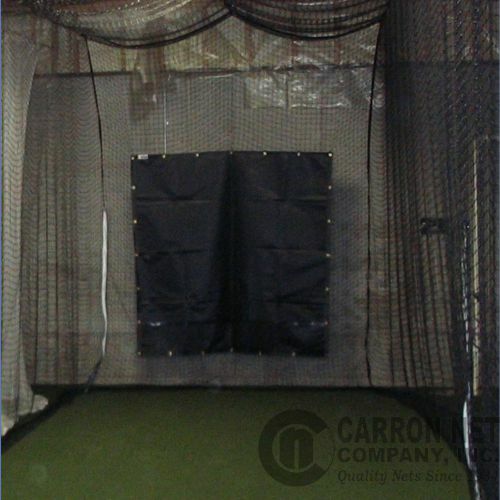 Frequently used for: baseball and softball batting cage backdrops and dividers, heavy duty divider curtains and nets.